For rapid, quantitative, bioluminescent determination of ATP and evaluation of drug effects on ATP metabolism. • Sensitive and accurate. 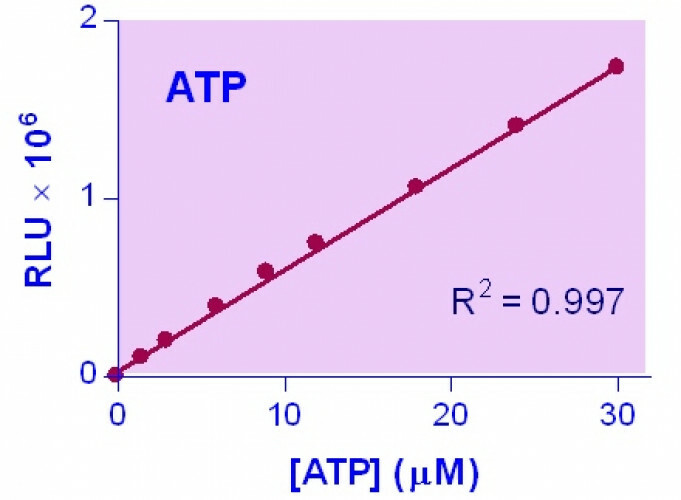 As low as 0.02 μM ATP or a single cell can be quantified. • Robust and amenable to HTS: Z’ factors of > 0.5 are routinely observed in 96-well and 384-well plates. Can be readily automated on HTS liquid handling systems. Adenosine 5’-triphosphate (ATP) is the chemical energy for cellular metabolism and is often referred to as “energy currency" of the cell. ATP is produced only in living cells during photosynthesis and cellular respiration and consumed in cellular processes including biosynthetic reactions, motility and cell division. It is a key indicator of cellular activity and has been utilized as a measure of cell viability and cytotoxicity in research and drug discovery. BioAssay Systems’ EnzyLight™ ATP Assay Kit provides a rapid method to measure intracellular ATP. The single working reagent lyses cells to release ATP, which, in the presence of luciferase, immediately reacts with the Substrate D-luciferin to produce light. The light intensity is a direct measure of intracellular ATP concentration. This non-radioactive, homogeneous cell-based assay is performed in microplates. The reagent is compatible with all liquid handling systems for high-throughput screening applications in 96-well and 384-well plates. Applications For rapid, quantitative, bioluminescent determination of ATP and evaluation of drug effects on ATP metabolism. References Assay: cells in mouse (Pubmed). 2. Aflaki E, et al (2011). Triacylglycerol accumulation activates the mitochondrial apoptosis pathway in macrophages. J Biol Chem. 286(9):7418-28. Assay: macrophage in mouse (Pubmed). 3. Schwarzer C, et al (2008). Oxidative stress caused by pyocyanin impairs CFTR Cl(-) transport in human bronchial epithelial cells. Free Radic Biol Med. 45(12):1653-62. Assay: cell in human (Pubmed). 4. Belleannee C, et al (2010). Role of purinergic signaling pathways in V-ATPase recruitment to apical membrane of acidifying epididymal clear cells. Am J Physiol Cell Physiol. 298(4):C817-30.Assay: tube in rat (Pubmed). 5. Dvoriantchikova G, et al (2010). Liposome-delivered ATP effectively protects the retina against ischemia-reperfusion injury. Mol Vis.16:2882-90. Assay: retina in mouse (Pubmed). 6. Khuda-Buksh, AR. et al. (2011). Analysis of the capability fo ultra-highly diluted glucose to increase glucose uptake in arsenite-streesed bacteria Escherichia coli. J, Chin. Integrative Medicine 9(8): 901-912. Assay: cell lysate in bacteria (Pubmed). 7. Sugimoto S, et al (2009). Apyrase treatment prevents ischemia-reperfusion injury in rat lung isografts. J Thorac Cardiovasc Surg. 138(3):752-9. Assay: lung tissue in rat (Pubmed). 8. Ponnusamy M, et al (2011). P2X7 receptors mediate deleterious renal epithelial-fibroblast cross talk. Am J Physiol Renal Physiol. 300(1):F62-70. Assay: fibroblast in rat (Pubmed). 9. Choi EM, Lee YS (2011). Protective effect of apocynin on antimycin A-induced cell damage in osteoblastic MC3T3-E1 cells. J Appl Toxicol. 2011 May 2. doi: 10.1002/jat.1689. Assay: cell in mouse (Pubmed). 10. Methods for treatment of oncological disorders using an epimetabolic shifter (coenzyme q10). US Patent Appl. 20110027247. Assay: cell in mouse. 11. Methods for treatment of metabolic disorders using epimetabolic shifters, mutlidimensional intracellular molecules, or environmental influencers. US Patent Appl. 20110020312. Assay: cell, environmental in human. 1. Chandak PG, et al (2010). Efficient phagocytosis requires triacylglycerol hydrolysis by adipose triglyceride lipase. J Biol Chem.285(26):20192-201. Assay: cells in mouse (Pubmed).